I wanted a simple project on which to practice Irish cottage (lever) knitting using straights and involving both knitting and purling. 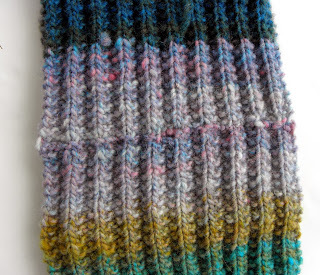 There is not much of anything simpler than a scarf, so I grabbed some bits and bobs of Noro left over from another project and knit me a mistake rib scarf. Since I was using bits and bobs, the color shifts are a bit abrupt, and since I was using left overs, the inevitable happened: I ran out of yarn before I ran out of scarf. So I decided to graft the two ends together, creating a loose cowl. I had not planned to do this in the first place, which meant I had to pick out the cast on. And then I realized I had no idea of how to graft ribbing, let alone mistake ribbing. 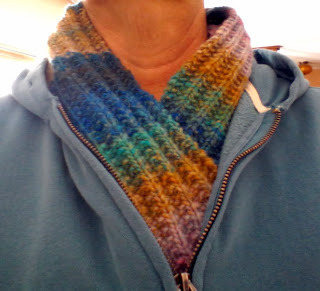 I did a little online research, which gave me some ideas, but after the scarf/cowl (scowl?) lay on the coffee table for a couple of weeks, I wound up grafting the ends like they were garter. Another thing I did not plan was beginning and ending with the same color, so that was just dumb luck. Pattern: None. Cast on 39 stitches, knit mistake rib until you run out of yarn. Join the ends. Greens and browns are not colors I usually wear, but after blocking the scarf, I spontaneously tried it on. It's the perfect accompaniment to my green sweatshirt, especially since it is still ridiculously winterlike around here. In the Easy as Pie saga, I first knit the LLI stitches as M1's because I did not understand the stitch description in the pattern. The result was a bit lumpy. Then I knit the LLI stitches as KFB which reduces the lumpiness in the pie but left holes in the square around the pie. Then I consulted the Internet about LLI and discovered, no, the pattern designer did not make up that stitch like I thought (because I am such an expert). In fact, here is a good description of LLI and all its cousins. Now the lumps are gone, the holes are gone, and once again, we can forge ahead, having learned something new. The only question remaining is, will I reknit the first two squares? Can you see the difference? Or will it just bother me? I like to knit shawls but I don't like to wear them. The blocking does not hold, they don't stay on my shoulders, the yarn sheds, etc. BUT. Last Thursday, tired of wearing layer upon layer, I chose a single cashmere turtleneck sweater (a gift - I can't afford cashmere!) 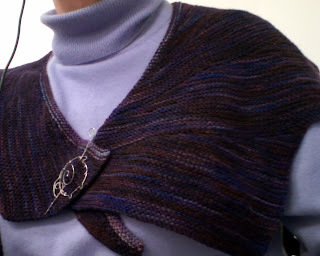 I didn't think it would be warm enough by itself, so I added the Wingspan shawl and a shawl pin I had not yet used. Voila! Not only was I warmer, but I received complements on the pairing of sweater and shawl. (I rarely get compliments about my fashion sense, so this is a big deal.) And it did add just enough warmth to keep me comfortable throughout the day. Now I'm thinking shrugs might be a nice thing to add to my wardrobe. I'm working on a blanket for my granddaughter, something with bright primary colors that might be finished by the time she goes to college. The pattern is "Easy as Pie" and, once you get past a practice square, it is fairly easy. It is also rather clever. You knit the radii of the circles, making increases to fill in the space between the radii, then recapture those increases to keep from wandering off into who-knows-what kind of rainbow spiral. It's those increases that have been a puzzlement. The pattern says to "Use the left needle to pick up left leg of the purl stitch below the last stitch on the right needle. 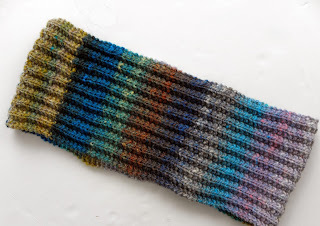 Knit into the back leg of this stitch." Not understanding this at all, I simply did a M1 instead, but the results were a bit bumpy. 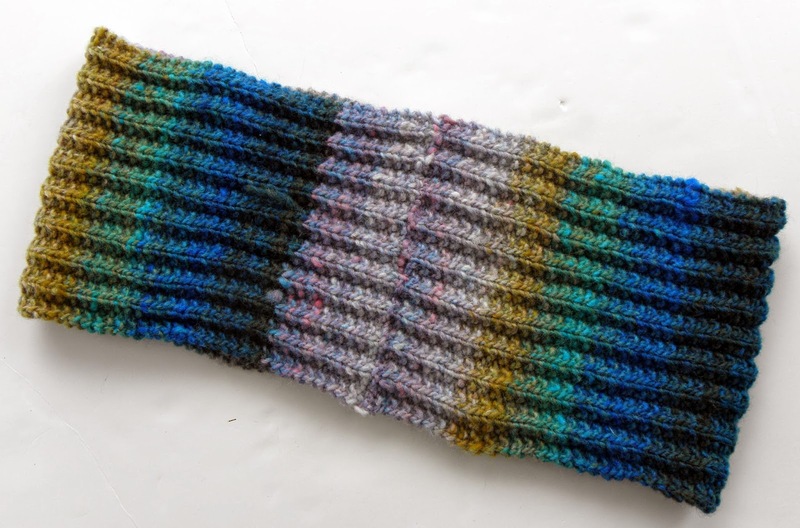 On the next square, I made more of an effort to follow the instructions, but I am not seeing the difference between those instructions and simply knitting through the front and back of that last stitch. I don't know if what I am doing is correct, but the result is much smoother. Whatever. I'm going to stick with the latter method and forge ahead. The lever knitting is getting better. Stephanie said practicing ten minutes a day for 30 days would be enough to create the muscle memory to transition to this new way to knit, but she did not take into account how difficult it is to teach an old dog new tricks. I have been at it for 100% of my knitting time since Thanksgiving weekend and am finally getting comfortable with it. There for a while, it was such a struggle I didn't even want to pick up the needles. Even now, I can be cruising along, and yet hit a wrenching road bump the next day, the next hour, even the next row. It gets better every day, though. My knitting mojo is back.